The postponed India-Africa Forum Summit remains an important opportunity for both players. The Indian Ministry of External Affairs recently announced that it would be postponing the third India-Africa Forum Summit, which had been scheduled to take place in New Delhi in December 2014. The main reason behind the decision appears to be the ongoing Ebola epidemic in Western Africa. Besides the more obvious risk of spreading the disease through intercontinental travel, it would have appeared indelicate for African heads of state to feast at banquets in New Delhi while the outbreak raged back in West Africa. Subsequently, the Indian government pushed the summit to an unspecified date in early 2015, leaving many observers to curiously await Prime Minister Narendra Modi’s Africa policy, which he had been expected to reveal at the summit. The India-Africa Forum Summit is only one of four major international initiatives that court African leaders. This year had already seen two of the others: the EU-Africa Summit in Brussels in April 2014 and the U.S.-Africa Leaders Summit in Washington D.C. in August 2014. While April’s EU-Africa Summit had been held three times previously (at irregular intervals), the U.S.-Africa Leaders Summit was inaugurated this year. It was widely seen as a belated attempt by Washington to counter growing Chinese influence across Africa. China arguably still leads the pack when it comes to courting African leaders, with its Forum on China-Africa Corporation (FOCAC). The fifth of these ministerial meetings – it takes place every three years – is scheduled for South Africa in 2015. With India postponing its India Africa Forum Summit, African leaders will now be able to attend summits with both India and China in 2015, which might make for some interesting comparisons. India’s Africa summit has arguably had the weakest reach of all four meetings. The Indian government therefore made one significant change to this year’s edition: Unlike in previous years, the Indian government invited all 54 African heads of state to New Delhi. At the previous two meetings – in New Delhi in 2008 and Addis Ababa in 2011 – the number of African participants was limited to a maximum of 15 heads of state, chosen by the African Union to represent the entire African continent. Why the Indian government chose to expand the scope of the summit ultimately remains unclear. Possible explanations include the success of FOCAC and the apparently ever-increasing number of Chinese actors on the African continent; the revamped efforts by the United States and European Union to strengthen relations with African leaders at their respective Africa summits earlier this year; or attempts to increase cooperation between African states and India as part of India’s wider foreign and foreign economic policy goals. The India-Africa Forum Summit will not only be interesting to observers because of the expanded invitation list (and the hard reality check of which heads of state will actually choose to show up). After nearly six months in office, the Modi administration has yet to reveal its vision for India’s cooperation with African states. It remains to be seen whether or not the prime minister will now wait until the new date for the meeting is set or unveil his plans first. Recently, it has been the Chinese who have created the headlines, as demonstrated again last week by the announcement of a $12 billion railway construction deal for the China Railway Construction Corporation in Nigeria. However, if Modi’s first months in office are any indication, African leaders might be well advised to follow his invitation to New Delhi. In light of Africa’s increasing dependency on and trouble with Chinese actors, African leaders are beginning to look beyond China in an attempt to diversify their foreign partners. Modi’s new India might turn out to be the one viable alternative to China’s seeming omnipresence on the African continent. And while both Beijing and New Delhi never tire of emphasizing their friendly relations in general and towards Africa in particular, Beijing will also have a keen interest in keeping a close eye on Modi’s approach to Africa. India is not yet a game changer, but under a foreign-policy-savvy Modi it will likely become a contender to China’s economic hegemony across Africa. Until now, India’s trade with Africa is still dwarfed by that of China, despite India’s favorable geographic proximity to East Africa and longstanding cultural, political, and economic ties with the continent. Indian overall trade with Africa stood at around $70 billion in 2013, while China continues to lead at around $200 billion, followed by the U.S. at $90 billion. 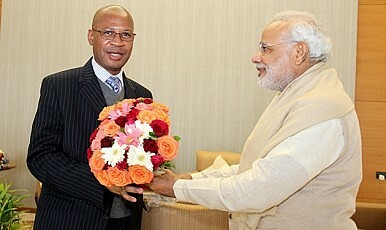 Looking at Modi’s foreign policy so far, however, African leaders (and Beijing) should at least expect three things from him in 2015: a more active foreign policy, the potential to encourage greater Indian investment abroad, and a more active involvement of India’s sizeable global diaspora. Since assuming office in May 2014, Modi has reoriented India’s foreign policy from its previously passive approach towards a more active and goal-oriented approach, strongly pursuing India’s interests abroad. His travelling schedule and appearances in the first few months in office quickly signaled a confident approach, which will use foreign policy to strategically further his domestic goals. Modi significantly increased the number of staff in the prime minister’s office, which allows him greater control over all aspects of India’s policymaking. Additionally, India’s “developing country” rhetoric has disappeared in its foreign policy narrative over the past months, to be replaced by rhetoric signaling a more active Indian stance: At the recent ASEAN summit in Myanmar, Modi turned away from India’s long-standing “Look East” to an “Act East” policy. Modi has demonstrated a tighter grip on Indian policymaking in the first few months of office. His initiatives have largely remained unspectacular, but he has nonetheless addressed long-overdue domestic issues, such as the subsidy policies in the petroleum sector and reform of India’s planning commission. His reforms have the potential to remove bureaucratic bottlenecks and speed up government approval processes, which in the past have been a major obstacle for Indian investment abroad. Chinese commercial actors often outperformed Indian state-owned enterprises (known as Public Sector Undertakings) because of the slow and bureaucratic government approval process within India. At the same time however, while Chinese commercial actors are known to secure large-scale projects (see the $12 billion railway project in Nigeria last week), Indian companies have successfully managed to fly under the radar and benefit from less prominent projects. Indian state-owned and private commercial actors also offer African states the chance to diversify their non-Western investment partners. This diversification helps to lower their dependency on China significantly, without the need to turn back to Western countries. India remains less able than China to offer large-scale infrastructure projects backed by commodity deals, but it does offer other (arguably more sustainable) benefits to African countries, such as its experience in education and human resource development. It remains up to African leaders to realize the potential longer-term benefits that cooperation with Indian actors may yield. Modi’s strong embrace of India sizeable global diaspora is the last aspect African leaders should watch out for in Modi’s Africa policy. India’s diaspora across Africa is sizeable: It is estimated to amount to around three million people, without taking into account temporary migration workers. Since assuming office, the Modi administration has displayed great interest in engaging with India’s global diaspora, which for Modi functions both as an international lobby group as well as a sounding board for his domestic performance. Modi’s appearances in front of Indian groups in New York and Sydney are an indication for the hype he has managed to create among some of the diaspora. Engaging with overseas Indians will be especially relevant across Africa, where the Indian communities not only have strong cultural and political ties, but also represent an important economic force. The upcoming India-Africa Forum Summit is a chance for Modi and his administration to jump-start relations between India and Africa. Securing the attendance of as many African heads of state as possible, however, will require the prime minister to send strong signals to African leaders ahead of the summit. A successful gathering will benefit both India and Africa. India will be able to send a strong message across the African continent that it is ready for greater engagement and investment in Africa, which will become especially critical for India’s energy sector. For their part, African leaders have the chance to signal to Beijing that there are viable alternatives to the Chinese investment model. Ultimately, the success of the next India Africa Forum Summit as well as the future of India-Africa relations not only depends on India’s ability to develop an attractive and sustainable approach to Africa, but also on the willingness of African leaders to look beyond Beijing when partnering up with foreign investors. Tim Steinecke is a doctoral candidate at the University of St Andrews. He is currently a visiting fellow at the Observer Research Foundation in New Delhi. Tim can be found on Twitter @TimSteinecke. The views expressed here are the author’s own. China Is Winning the War for Nepali BuddhismIndia’s Sikh Sensitivities and Canadian PoliticsExplaining China’s Latest Catch in AfricaIndia Doubles Down on Chabahar GambitCan Bhutan's New Government Avoid Doklam 2.0?